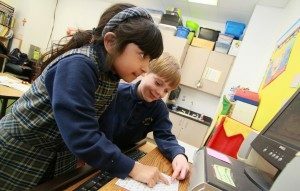 Primary level programs in the Lower School (grades K-4) focus on the cognitive, social, emotional, spiritual and moral development of our students. In a nurturing environment, we offer instruction in the major academic areas, religion, Spanish, music, physical education, art, library and technology. Lower School students participate with their older peers in weekly assemblies and chapel studies. Lessons are comprehensive and integrated to provide a meaningful context for our youngest students. As they transition to intermediate elementary grades, special emphasis is placed on the guided application of our core values and Traits for Success. Enriching field trips, science fairs, thematic projects, academic competitions, poetry recitals, community service projects and stage performances add depth to knowledge gained in the classroom.